This pattern makes a simple lace shrug that’s perfect to wear when you’re just a little bit chilled. 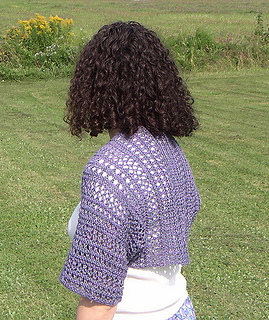 Unlike most shrugs that are knit side-to-side, the lace pattern produces visual vertical lines when worn. When designing it, I was surprised that such a fancy-looking pattern would arise from such simple stitches (of course, isn’t that what lace is all about? ); and, the construction is just a rectangle with the ends sewn to make sleeves. Any wool or wool-blend worsted yarn should work for this pattern. When blocked, the half-sleeve version measures 16” around the sleeve-ends and 38” from end to end if knitted as written. 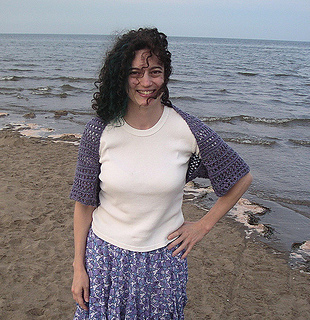 For longer sleeves, just knit more repeats of the pattern. (However, you’ll need more yarn.) In particular, half-length sleeves require a total of 300 yards of yarn and 3/4-length sleeves require a total of 360 yards of yarn; and, in general, every extra 3.5” of length requires an additional 30 yards of yarn. Techniques and stitches used: casting on, knitting, purling, yarnover, slip-slip-knit, slip-slip-purl, knit two together, purl two together, binding off, whipstitching.